To change the default settings, navigate to the Settings > Timesheet Settings. When the Weekly Timesheet Reminder setting is switched on, we send the users who have fewer Working Hours per Week a reminder to complete their timesheets. For more information on Weekly Timesheet Reminders, refer to this post. You can choose the format for displaying time by selecting either Decimal Hours or Hours and Minutes (2.5 or 2:30 for 2 hours 30 minutes). For a more detailed explanation on entering time in different formats in Avaza, refer to this FAQ. You can also apply rounding to timesheets, which is particularly useful when creating time-based invoices. Rounding is displayed when timesheets are added to an Invoice, and can optionally be applied when running reports. 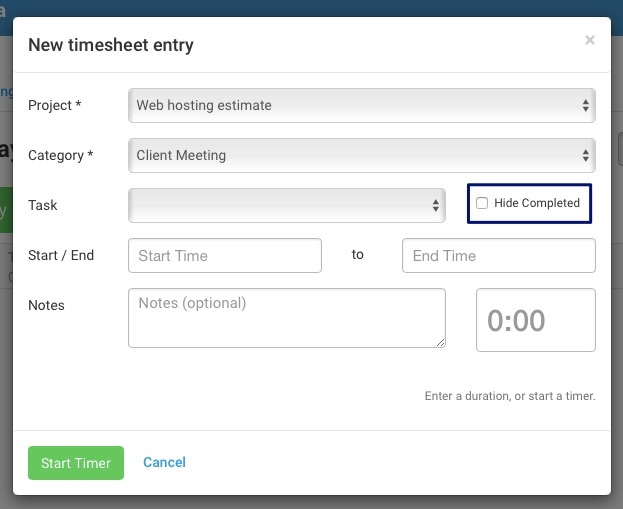 This setting allows you to prevent users from editing approved timesheets. Click here for more information on locking timesheets. 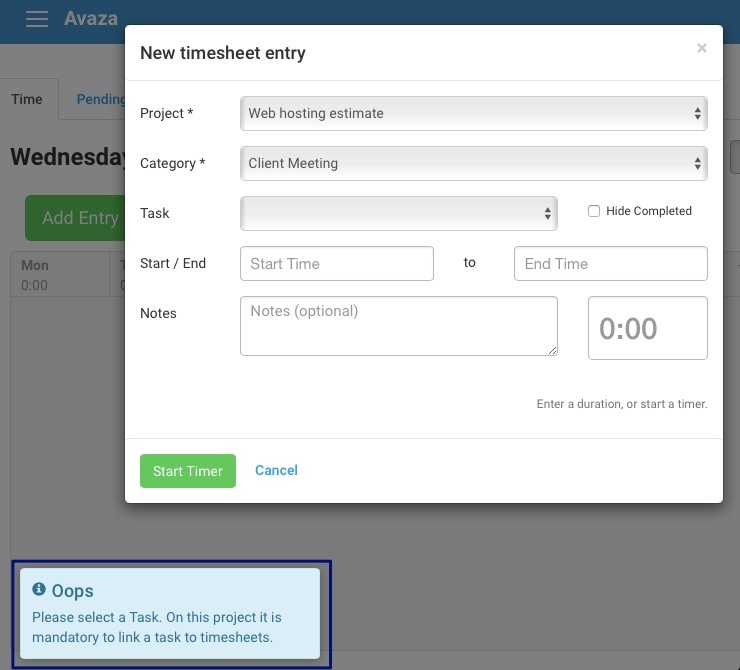 Enabling this feature makes it mandatory for each user to select a task when logging time. If a user only selects a project and category without a specific task, the system will generate a pop-up as shown below preventing them from saving the entry. If enabled at the account-level, this setting will be applied to all new projects by default but you can override it at the project-level by going to Project Settings. By default, you can see all tasks in the Add Time Entry drop-down, including completed Tasks. By enabling this feature, the user will see a checkbox that filters out the completed tasks. This allows the user to view a more manageable and relevant task list in the drop-down. 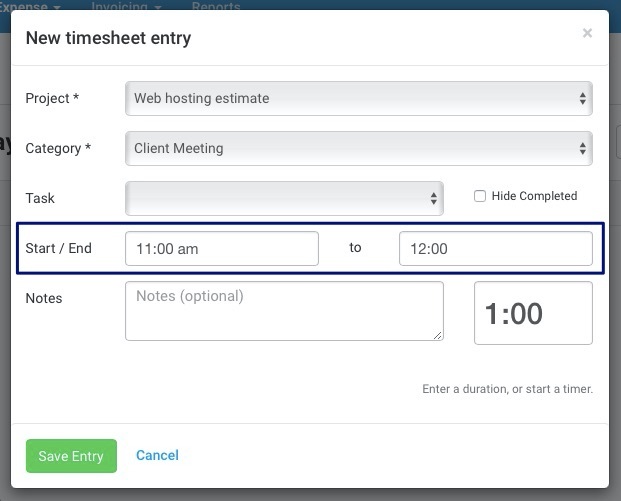 If enabled, a start and end time field will appear in the timesheet entry pop-up. Read more about start/end time settings here. By default, time is recorded in 12-hour format, i.e. 2:00 pm. If you’d like to change it to the 24-hour format, i.e. 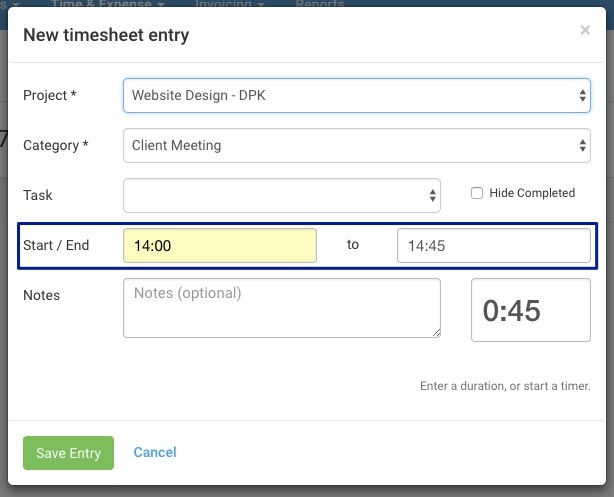 14:00, you can enable this feature from the Timesheet Settings page. Timesheet categories help define billable and non-billable timesheets. 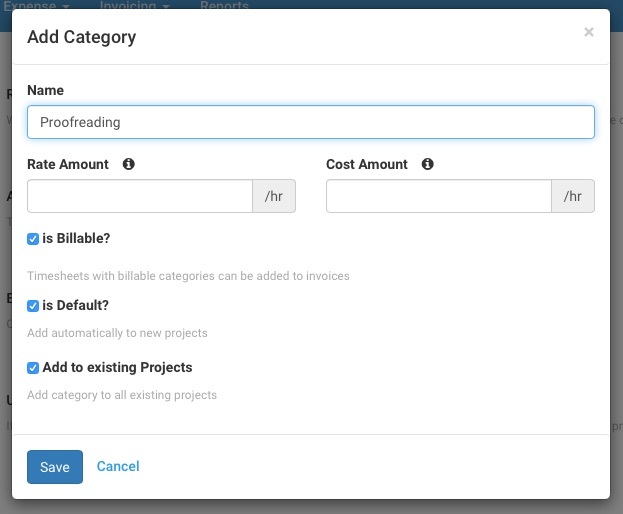 You can edit existing or create new categories by clicking on Add Category, assigning billable or cost rates (if applicable) and changing the billable setting as needed. Note: When calculating Timesheet Costs, we prioritize the Timesheet Category Cost Rate over the Person Cost Rate. If you would prefer to use use the Person Cost Rate, then do not enter a cost rate for Timesheet Categories. For more information on timesheet categories, refer to this guide, or contact our support team via chat or email.